This is a beginn er’s level tango class with mixed levels of beginners. Some of you have been dancing for a while, others are taking their very first tango class. All of which works just fine. Tango is a dance that you can enter into from various points. So even those for whom this is the very first step in tango, you will find that you can do the pattern. I’ll explain why. First, at the risk of demystifying a dance that Argentines say it takes a lifetime and a half to learn, let me simplify it anyway. I like to say there are five basic steps in tango that beginners learn. Those steps are: walking, the cross or cruzada (or 8-count basic), front ochos or figure eights, back ochos, and molinetes or grapevine turns (mostly done by the follower around the leader). However, breaking down the dance of tango even more, we get to what is broadly called “technique”—the all-important manner in which you execute the steps. Again over-simplifying perhaps, technique involves smoothly executing the way you walk, the pivots in ochos, and the frequent rotation or spiraling of the upper body in opposition to the lower body, often called contra-body movement (CBM). Technique further involves how you connect with your partner and how you interpret the music. Briefly, tango music is a huge body of different styles with complexity comparable to that of jazz, say. Most newcomers to tango music have a hard time hearing the beat. The good news is that there are popular composers, most notably Carlos DiSarli, whose very romantic music is easy for beginners. You can find the beat easily and you can step half time or slowly. DiSarli’s music, unlike say Biaggi or D’Arienzo, is not so emphatic in its rhythm. The best and only way really is to constantly listen to the music and to dance to it with as many partners as possible. ¡Bailamos! Let’s start with La Cunita, a word that means “little cradle.” The leader initiates the rocking of the cradle. He steps forward on his left foot, straddles his weight as he rocks the follower, as we’ll see in class, in a tight figure-eight. The follower feels the leader ask her to stop walking backwards when her right foot is planted and she too distributes her weight on two feet (an unusual occurrence for followers). This is a bluesy smooth move. Some of you will find it easier than the media luna with its defined footwork. Some will find it harder because it’s open to individual interpretation. The media luna is a good pattern for beginners because it involves all the technique mentioned above—walking, turning with body rotation, pivoting, and connecting with our partners. And the follower g ets to cross in a clear easy way. Unlike most classes I teach, I’ve broken down the lead and follow into parts you can count to. The leader will count 8 steps, while the follower will count 10 (we’ll see why in class). The counting is an aid—don’t get too attached to it. I hope by the end of the class both lead and follow will top counting and just smoothly let the pattern happen. Leader: 1. right foot back 2. left foot side steps to left. 3. right foot hooks or crosses behind 4. Heels raised, leader pivots about 180 degrees. 5. right foot collects or closes to left. 6. Left foot steps forward 7. right foot steps to the side. 8. left foot collects or closes to right foot. Follower—again note, you have 10 steps in this pattern and your steps are about the same size in width or length as the leader’s: 1. Facing leader, step forward on left 2. right foot steps to the side 3. collect both feet as you pivot to your right & step left foot back in first ocho 4. second back ocho to left side 5. left foot steps left around leader in an open step 6. right foot steps forward with body rotation or CBM around leader 7. left foot crosses in front of the right (nice & tight) 8. right foot walks back. 9. left foot steps to the side 10. right foot collects or closes to right foot. Putting tango instructions to paper is helpful but as with cooking it’s only the bare bones recipe – not the actual dish. 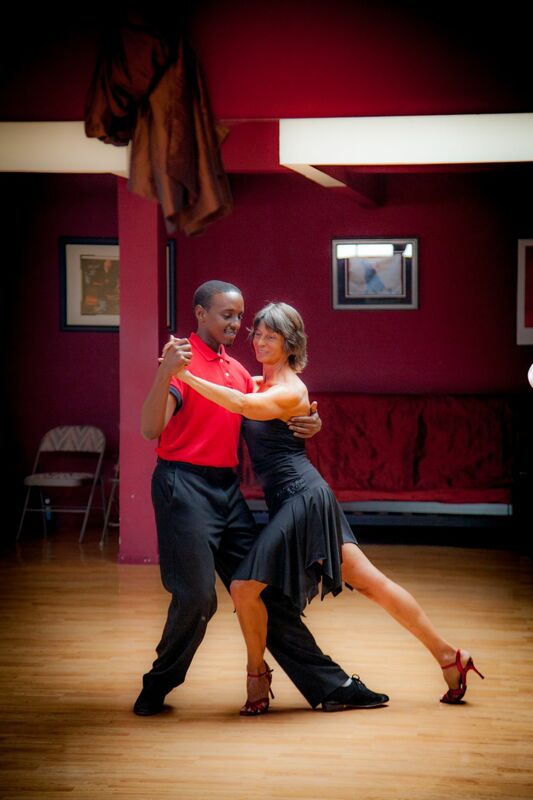 Keep on practicing and dancing and savoring tango. Make tango your own dance. Find your tango secret. Everybody has one.